If you have ever maintained a swimming pool you’ll know pool water chemistry is very much a balancing act. Companies who offer free products and services, such as Facebook and Google, have a similar balance to maintain between their customers and their members (or users). Favorable adjustments on one side of the relationship can have negative impacts on the other. Finding the right balance is paramount to establishing the correct environment (for engagement and activity in Facebook’s case) and yielding returns. A symbiotic relationship forms in these business models – the customers pay the bills providing users with free access to the products and services. In other words without customers there are no users and without users there are no customers. Simple? The management of this symbiotic relationship is a skill often overlooked or misjudged. It is a skill which I’m willing to bet consumes a large proportion of management time in companies employing this model. It is a skill that when developed, becomes a significant strength to the organization. The environment or model forces the hand, and the skill allows these companies to address issues and complex problems. The net result – balanced chemistry. Facebook has made mistakes, some arguably as recently as this week such as the email switcheroo, however overall the company has proven themselves here where many companies fail. And so the infamous interstitial ad is born – loved by marketers and the sales team who sells them, hated by users (interesting post by Michael Arrington). In fact we heard a similar case earlier this year as General Motors famously announced, just days before the IPO, that it would no longer advertise on Facebook. Turning down a million dollar customer is not a decision made lightly. These decisions undoubtedly come from the top and sacrifice short-term gains for long-term vision. To the user this is a no-brainer for update, it’s useful information to share and requested in a non-intrusive way. To the customer, its valuable demographic information which no doubt sizably improved Facebook’s targeting segments. A perfect balance – customers are able to target more users, while the user experience is improved through better targeted services and ads while not being interrupted with 5 new fields added into the registration process for example. 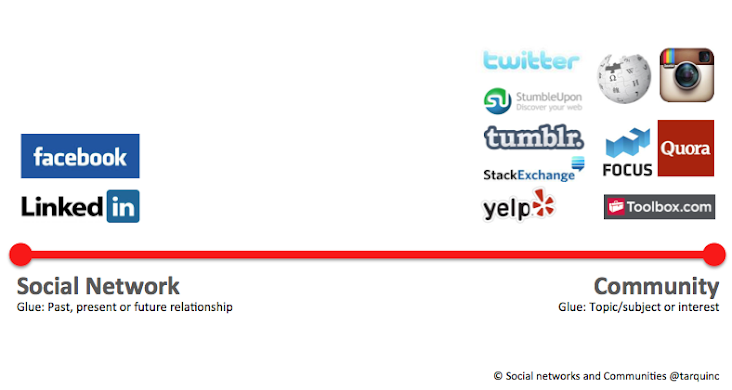 It’s been well documented Facebook needs a solution to monetize mobile – they cited it themselves in their SEC filing. We should congratulate Facebook and honor their skill in ‘maintaining the balance’ to this point as the very reason you do not see banner ads in their mobile app. As a leading player in the web, Facebook is at the bleeding edge of technology and user experience. With over 900m active users (as of March 2012) Facebook has significant influence – meaning when Facebook makes a move many other web properties and sites follow. We have seen this as news feeds, messaging, navigation, simplified registration, like / vote up, buttons and styles etc. all take steps towards becoming standards. The advertising industry has established standards – from billboards to newspapers and magazines, to websites and now mobile (both governed by the IAB). The agencies have great fun and deliver some wonderfully creative campaigns within these guidelines – note the McDonalds sundial billboard below which points out the appropriate sandwich based on the time of day… The difference here is that Facebook is rejecting these advertising standards as they don’t take into account the symbiotic relationship – they upset the chemistry and therefore threaten the business model. The BBC News iPhone App (shown above right) is a great example where the user experience is distracted by a banner ad running across the screen – worse still the advertisement is untargeted adding little-to-no value. The fact Facebook makes these decisions every day, positions it well to deliver a solution to monetize mobile in a balanced and non-intrusive way. They have the ‘skill’, the resources, the experience, the motive and the influence to find and establish alternatives. What they need is to find the balance – ongoing success depends on it. Image credits: Facebook office: flickr/pshab. McDonalds billboard: dsgnwrld. IAB display unit sizes: Wikipedia. As the human race we have a track record of continually evolving and improving our environment and lifestyles. Whether it’s via natural selection, competition, advances or some other driver – we adapt, we change. New technologies for example, bring efficiencies and enable behavioral shifts simplifying and making possible what once was difficult, expensive or perhaps even unobtainable. Over the past decade we could point to hundreds of examples – kinetic energy systems in vehicles or mobile devices delivering a wealth of information being just two. b.) our ability through emerging social discovery channels to by-pass many of the regulations which govern us today. Take two traditionally ‘black box’ industries, such as the medical profession and financial services. These two industries are ripe for epic change over the next decade – and that’s exciting because… it impacts all of us. Have you ever been frustrated at the treatment of individual conditions, “here take this course of xyz”, as opposed to your doctor taking a more systemic and preventative approach looking at signals your body is telling you in your biomarkers and taking time to understand why your body is reacting in the way it is? Emerging biotech companies such as Scanadu and WellnessFX will help shift the dynamic between Dr. and patient. After all we have the ability to know more about ourselves than a stranger, and in a very short time we will be empowered with the data and information to have a comprehensive two-way discussion, where you will be able to have more input into any proposed treatment. It’s funny to think that for years we once kept log books showing the services performed on our vehicles, yet paid less attention to our health. This will change – we’ll know much more about ourselves and have this information readily at our fingertips as opposed to being under lock and key in various medical facilities. With our new found quest to optimize our systems, eating habits will shift radically. The downstream effects should not be underestimated, stores such as Whole Foods with their established supply chains will be well positioned compared to the many restaurants and supermarkets that built their operations and profits on food with low nutritional value. Supermarket floor plans will change radically yielding more space for healthier options. As banks continue to build distain with their customers by charging fees and increasing borrowing rates, new entrants offering ease-of-use and a fee free approach will shake up the industry. Emerging players such as Simple have this very vision. Another driving force of change will be mobile payments. As many financial industry players scramble to offer their versions of the mobile wallet, consumer centric companies such as Google and Apple challenge with better solutions. However mobile wallets and pre-paid card solutions remain clunky (see the Kangae post, ‘One Continuous Groove’), and its only a matter of time before this step is removed altogether and replaced with a single monthly invoice – perhaps as mobile operators such as AT&T, Virgin Mobile (leveraging Virgin Finance in UK and Australia) or Vodafone for example move into the credit space with their advanced billing systems and large customer base. It wouldn’t take much to win over customers – lower rates and an innovative rewards scheme. Card providers such as American Express and Visa suddenly have new and powerful competitors capable of taking out sizable portions of their business. Just as online search replaced spending hours in libraries looking up reference material, Social discovery is what threatens classic search as we know it today. It should come as no surprise therefore that Social discovery is what differentiates Google+ from Facebook (see Google+ hits the social sweet spot). Community managers are no strangers to social discovery – they have after all been working in this space for many years. They understand the immediate value in connecting people with a shared interest and expertise in a topic; not to mention the numbers which count in your favor over a traditional social network such as Facebook or LinkedIn as – you don’t know more people than you know. The modern work environment changes considerably as customers seek out the subject matter experts (who are already establishing their personal brands). Professional communities today such as stackoverflow.com, focus.com and toolbox.com have the ability to better understand the behavior of a companies employees than the company itself. How many questions they answer, and how many people they help for example. This shift opens many possibilities for innovation and evolution of the work environment. The benefits to an organization of this type of visibility are outstanding – the ability to share the knowledge, foster discussion organization wide and also not forgetting fringe benefits such as ousting the soon to be control freaks of yesteryear who built their careers hoarding information thinking ‘knowledge is power’. It will be interesting to see how we evolve our governments and institutions which have traditionally controlled these aspects. Will it be a case of riding the wave and in doing so prompting further evolution with new business models, revenue streams, product and services, or perhaps there will be an attempt to yield control in some way – SOPA being a great example of a wake up call to governments. This all makes for an interesting decade ahead and one we should be excited to be part of. What makes you excited to be a citizen of earth? A leveling of the playing fields – the recent viral success of the Dollar Shave Club launch video is a great example of how a small business, with some creativity and a great product/service, can reach millions in a matter of days and stand alongside an established brand with a significantly larger marketing budget. A feedback loop – feedback from customers is a great way to improve your products and services. Yelp reviews, for example, give restaurateurs immediate free feedback and provide a previously lost opportunity to turn a negative experience into a positive one. With these new possibilities more readily available, it’s important for businesses to skill up and understand how to take advantage of them. Successful social campaigns are great to see, however many small businesses I run into locally appear to be either focusing on the wrong measurement of success, such as total followers/likes, or not setting one in the first place. It’s hard not to bump into a ‘Like’ sign as you go about your day. Now synonymous with Facebook, ‘Like’ bridges the digital divide by establishing a bi-directional throughway between the online and the offline. In doing so, Facebook has successfully branded an everyday verb in an interesting twist on the marketing nirvana of yesteryear which was ironically the exact opposite – to turn a brand into a verb. Notable wins went to FedEx (where FedEx-ing became a substitute for shipping in the US), Google (synonymous with search) and Hoover (where hoovering became a substitute for vacuuming in Europe). Whether it’s a shopping mall, a restaurant, a clothes shop, you name it – we’re asked to ‘Like’, ‘Follow’, ‘Plus 1’, or ‘Check-in’. Even the lettuce in a grocery store wants to be friends according to the message printed on its cellophane wrapping. Yet as with any other marketing campaign, a successful social campaign has a goal. It also requires an investment of time and resources and needs to be scalable. Any small business owner will tell you time is precious and ruthless prioritization is paramount to success. So how do you go about running a successful social campaign? Personally I find it beneficial to look at some examples of best practices – the how to’s, and their opposites – the how not to’s. With this in mind below is a tale of the good, the bad and the not so pretty which looks at 3 businesses and their use of social media. If you happened to be in a Sprinkles bakery on Monday and whispered, “Happy birthday Shakespeare” to one of their cupcake associates, chances are you would have received a delicious free vanilla cupcake with sprinkles. If you didn’t know about this you are probably not one of their 346K followers on Facebook or 83K followers on Twitter – both of these social channels are used to propagate a secret phrase every day to the cupcake following. The first 50 people to go into their nearest store that day and mutter the phrase receive the free cup cake offered. It’s a win/win. If I ‘Like’ or ‘Follow’ Sprinkles on Facebook or Twitter, they provide me with free cupcakes – assuming I make it to the store in time. There is a purpose clearly established. As the cupcakes are handed over to their new owners, the cupcake associates adds a count to their clipboard. The tally, no doubt reported back to corporate along with any sales and basic demographic information, allows cupcake HQ to measure the effectiveness of the social campaign. The secret pass phrase provides a degree of exclusivity and is more of a tactic in the overall campaign objective to drive more foot traffic into stores and ultimately sell more products. Overall the campaign is genius – once you are in the store not only do you feel compelled to buy something – a cupcake for the other half, kids, friend, colleague or yourself, you also get to try a cupcake you might not have typically tried – most of us after all are creatures of habit. Sprinkles social campaign was proven so successful it continues to be used even after the campaign was scheduled to end. Having established a following, Sprinkles also invites feedback asking connections to vote on their favorite cupcake. The end result, an engaged following, increased social conversation, and revenue funding growth in the form of Cupcake ATMs and 10 stores in North America. As I read this sign the age-old CRM adage, “What’s in it for me?” sprung to mind. There was no reason cited as to why I should ‘follow’ them. There was a QR code taking you to their Facebook page. Perhaps to see nutritional information – that could be a good reason, to access a secret menu or a word of the day for a discount. Yet there was nothing. So why would I pull out my phone and go to their Facebook, Twitter or Foursquare page when I’m in the restaurant having a bite with some friends? Perhaps curiosity was the tactic but it’s a stretch. What is concerning is the tremendous waste especially given the other demands on a small business owner’s time. Think of the effort to have the promotion sitting their on the table and the lost opportunity cost of perhaps using the space to market patrons a new smoothie, menu item or special which I could buy right there and then. Instead this flyer encouraged me to disconnect from my physical presence for a minute and ‘follow’ the restaurant. Out of curiosity I went to their Facebook and their Twitter pages later in the day and found a daily post demonstrating some effort being put into a social campaign yet also missing the mark. Their .com site on the other hand is packed with great information including nutritional information and sign up to their club, which provides a number of two-for-one style benefits. What is the cost of printing the flyer, maintaining the social sites, placing the card at each table? What is the opportunity cost? What is the distraction value of taking someone somewhere else when they are in front of you and ready to spend? This company is clearly going through the motions and checking the boxes yet are failing to go the last mile at this time. They have all the costs and none of the return. I fear this company is measuring success by total followers as opposed to new customers or increased sales, which is all to often the mistake. Picture a local pizza joint. There is a sign on the shop frontage and by the register asking patrons to, “Like us on Facebook.” If you go to their Facebook page and scroll back to the date of joining in 2010 it all started with what appears to be a picture a day. The pictures were a good tactic – a packed restaurant, a heart shaped pizza marking Valentines Day but the cadence of these posts dropped after a few months. Over the last 6 months they average less than 3 per month. It’s a local store, posting a picture of the fresh pizza just out the oven at lunch time is not a bad idea. Certainly worth a try. The shift in how we both find and consume information yields many opportunities for small businesses to leverage social campaigns and platforms for increased revenue. However with so much choice (Facebook, Twitter, Foursquare, Google+ etc.) not to mention maintaining a website, establishing and building a presence on each of these social sites must feel like the equivilant of carrying 5 or 6 different cell phones at the same time. As an industry we should be able to address this issue and we’re seeing it happen – consolidation through acquisition, the creation of standards, the advancement in tools such as Hootsuite, atomkeep, Seesmic, ping.fm, twitterfeed, which allow the management of multiple social profiles or at least the ability to post to multiple profiles, and further innovation. In the mean time, there are some creative examples out there which justify the investment and demonstrate that social is able to provide a distinct competitive advantage. The key take away – have a plan and work towards a clear goal. As businessman and columist Harvey Mackay once said, “Failures don’t plan to fail, the fail to plan.” Research and discuss techniques and tactics with others including your customers. Adjust your tactics based on your wins. Create a new social experience – something which is unique to your business and resonates with your customers – make the connection. Recognize the advantage over your competitors and know that many will give up. Don’t give up. Solicit feedback from your customers and act on the information accordingly. Data is your friend – remember how Sprinkles is collecting data and sending back to head office. On the tool side both Facebook Insights and Google Social Analytics provide some great dashboards – understanding this data will help you measure engagement along with your own sales information. You can’t manage what you don’t measure. Google+ lit up last week as comments and jokes bounced back and forth regarding the new user interface and the ‘mysterious’ white space to the right of the screen. Perhaps more poignant in the battle for most Monthly Active Users (MAU) – a key measure of engagement used by social networks – is how Google positioned its social offering. Often tagged as ‘late-to-market’ Google+ has received both positive and negative reviews. Few, if any however, have taken into account Google’s positioning in the heavily desirable and untapped white space that exists between Social networks and Communities. It is this positioning along with the insatiable interest in all things social, which might just provide the key Google needs to unlock the powerful network effects of Facebook. Grouping these sites based on their core allows us to quickly visualize and separate the two models. The primary difference is best described as the glue that holds them together. In a social network for example – a past, present or future relationship is what connects the members. In a community it’s a shared interest that brings people together. Think of a tennis club as an example of an offline community. Today, with social media being one giant melting pot term, the two models are commonly interchanged and the fact that they are two models (and very different ones at that) is often lost or overlooked. The large social networks and communities we use today are at the extreme ends of the scale creating an untapped space in the middle – essentially a foothold in both camps. These sites continue to invest considerable time and resources to nudge themselves more towards the center of the line suggesting a level of desirability held by the space – however given the difference in the models expecting this to happen overnight is akin to stopping an oil tanker on a dime. Facebook Subscribe allows users to ‘follow’ another user based on an interest however they may have no relationship with. Facebook Groups for Schools launched this month attempt to generate community within Facebook’s social network. To soon to tell but definitely worth watching. The reason content is king is because when combined with demographic and behavioral information it provides unmatched opportunities for targeting based on a users digital body language. Social network and community operators are essentially the brokers between advertisers and consumers. It is at the point these two parties meet that revenue opportunities exist. It is no surprise therefore that the 2 of the largest players in social networking – Google and Facebook obtain the majority of their revenues from advertising and arguably you could include LinkedIn as it obtains 30% from advertising and 45% from recruiting tools – which is essentially doing the same thing – matching users with interested parties (recruiters as opposed to marketers). Partner – LinkedIn and Twitter. Building takes time, buying requires care and diligence not to upset the foundation of community (see Instagram backlash) and partnering has its own risks given the intense competition in the space. Motorola employees may think back to the partnership with Apple after which Apple entered the phone business and almost destroyed Motorola’s handset division. Google+ is interesting because in being late to the game, Google had the opportunity to assess the market and position itself in the center. Given both LinkedIn and Facebook have been heading in this direction – could this be the sweet spot for social? 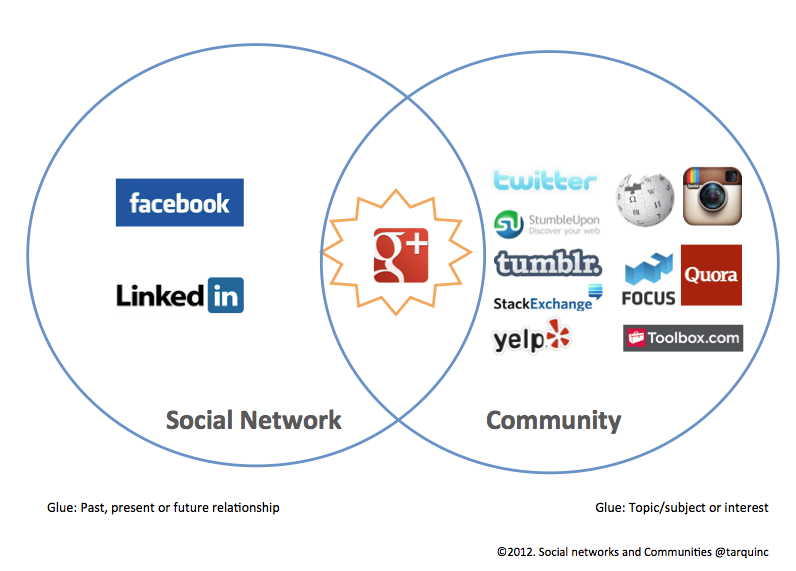 Google+ blends both community and social networking together. As a member you can participate based on interest, a relationship or both. This capability is build from the ground up and is the very fabric of the experience – it is a first and certainly not an after thought requiring a re-architecture akin to changing the engine while traveling at 100mph. The intuitive ‘circles’ enables users to manage the relationships and control their overall experience. Whilst this social sweet spot or ‘networked community’ for want of a better term is unchartered waters, it does provide a myriad of new opportunities and benefits to Google. Combine these with Google’s other well-adopted product lines such as Search, Gmail not forgetting the YouTube community and the possibilities begin to multiply. As users look for consolidation of their social presence in addition to increased value/return, and advertisers look to increasingly segment and target the pro-sumers, Google+ becomes a very attractive offering. 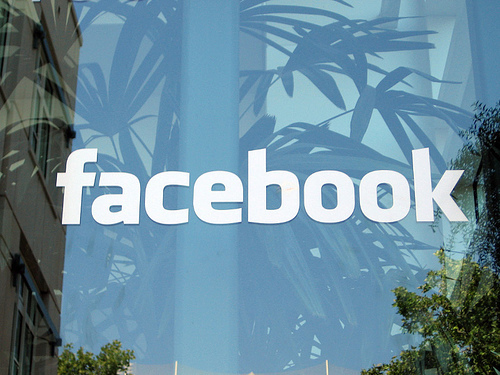 Will focusing on the upcoming IPO distract Facebook? Will Facebook be able to address concerns regarding the large numbers of its user base switching to a yet to be monetized mobile experience? Will Google and Facebook be able to walk the line between keeping their member base happy and offering value/return to marketers? Will Google be able to exploit its positioning of Google+ as a ‘networked community’ and clarify their offering as a new social experience? Will Google be able to leverage the developer community to bolster its offering? Will Google win over businesses and consumers to help drive a potential network shift? Will Facebook double down and wow us with something insainly brilliant? Will Google’s diversified product portfolio provide the leverage it needs to break the intensely strong network effects of Facebook? As these two titans battle out for most active users, perhaps LinkedIn will consider bolstering its community offerings with potential acquisition targets such as focus.com or Quora? We’ll find out the answers to these questions in the coming months – it’s going to be an interesting couple of years ahead. This article was originally published exclusively on socialmediatoday.com and gained ~300 shares in the first 48 hours helping it become the top post on the site that week.